My wife and I decided that we needed to go camping, so we packed up the tent and headed into the woods. I was a little nervous about the trip, not just because my wife is 4 ½ months pregnant and camping might not be the most comfortable way to spend the weekend. We weren’t able to find a dogsitter, so along with the camping gear we had our two dogs with us. Looking back, I think the dogs would have much rather preferred staying at home. We decided to visit Blanchard Springs, in the Ozark National Forest. The park is scenic, and the campground has real bathrooms (which is very important if you are pregnant). And a side bonus: the spring runs year-round, so we were guaranteed to have some water there, and waterfalls! We drove the twisty and curvy road up to Blanchard, and claimed one of the last sites in the campground. The dogs warily watched us put up the tent, and start the campfire. While dinner was cooking, I headed out to take a few pictures before it got dark. 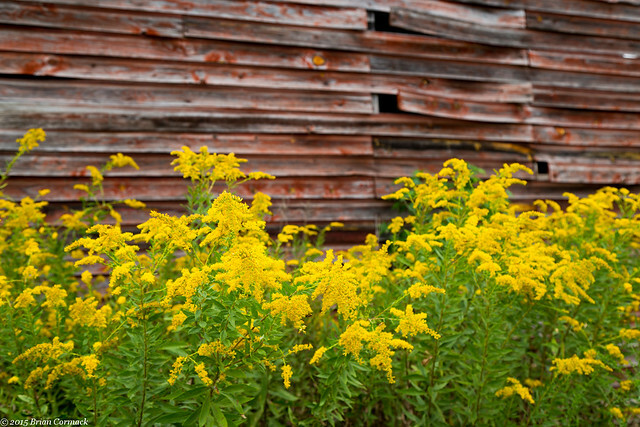 The first stop was at the old mill building, which was reached after walking along this wooden boardwalk. The leaves are just beginning to show some signs that autumn is about to arrive. There is just a hint of yellow mixing in with the green. The mill was built in 1900 and operated until 1928. 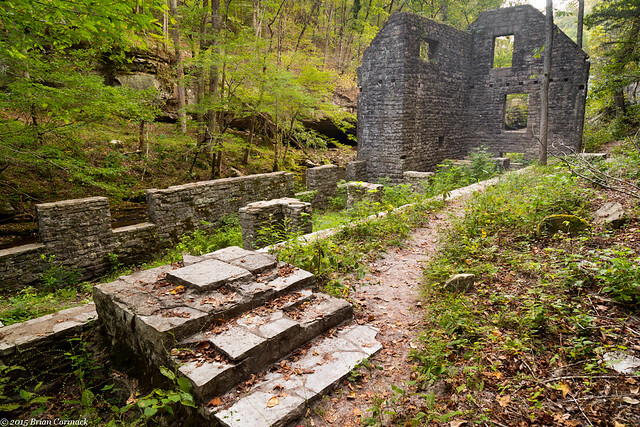 It was partially rebuilt by the Civilian Conservation Corps during the Great Depression, and the remains are still standing today. 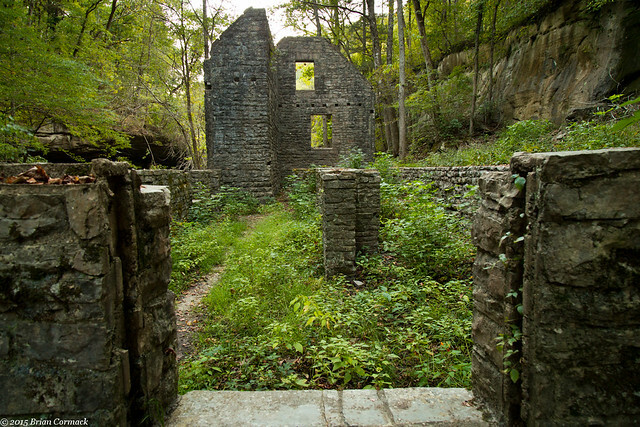 The mill sits right below a stone dam that was also built by the CCC in the 1930s. The dam was really well designed, with the builders being very thoughtful and including a few nice waterfalls in the spillway. 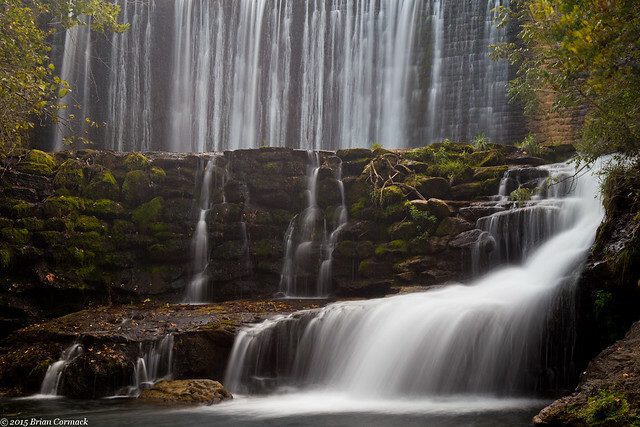 Since the creek above the dam is spring-fed, this is one of the only waterfalls that can be guaranteed to be running even in the driest of years. 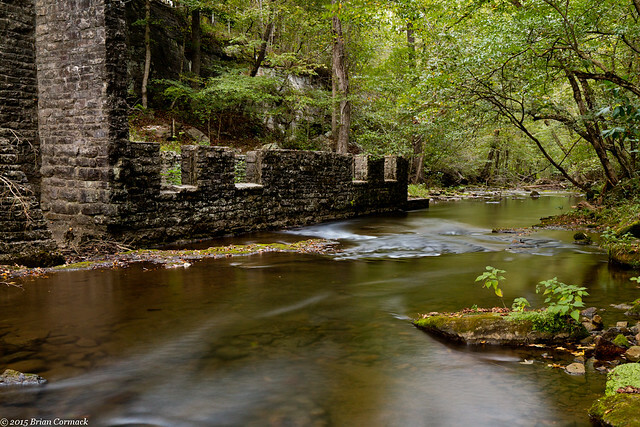 This is a view of the creek, as it flows past the old mill. 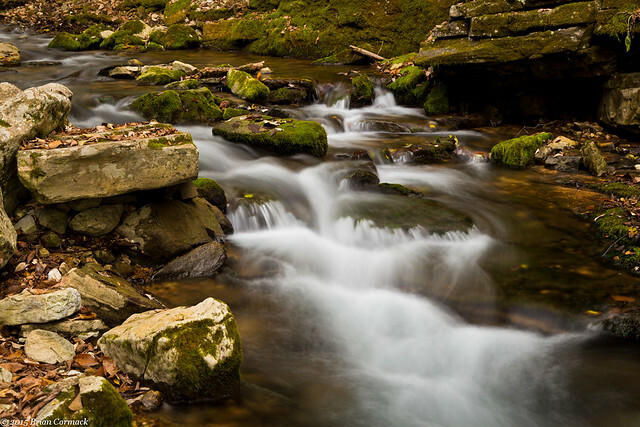 The rocks along the creek were slick, and many had a thick carpet of moss growing on them. Dinner was probably about ready, so I needed to head back to the campground. But I made one last stop at the old mill. It was getting dark, almost too dark to see. This was taken with just barely a hint of light left, and ended up being a 30 second exposure. I headed back to the campground, and my wife and I enjoyed a peaceful and relaxing night by the campfire. Our dogs, however, were not impressed with the surroundings. Gretta (our rescue dog who is a beagle/boxer mix) spent the evening looking in fear towards the source of any noises, and would tremble (especially if it was from small children – her worst nightmare). Other times both dogs had looks that were mixtures of confusion and annoyance. Why were we just sitting around outside? Why weren’t we home, where there was a comfortable sofa? They must have thought we had gone crazy. Overnight, they were surprisingly ok sleeping in the tent. Although Gretta was still scared of the woods. She would wake up and need to go out to pee. But then she would remember where she was and start shaking. So instead of using the bathroom, which she hadn’t done in hours, she would scan the woods for possible threats (such as the distant hooting of an owl, the constant chirping of bugs, a fellow camper talking, or the soft landing of a leaf on the grass). One time, probably around 4:00, I was out walking her around the campsite trying to coax her to pee. She wandered around in the dark, her eyes searching the trees for a threat. Finally she decided it was safe and she started to go about her business, but then she heard a distant noise and immediately bolted up and started heading back to the tent. I know she was nervous because of the woods, because usually she has no trouble with using the bathroom at home (our living room rug used to be her favorite place to go). I woke up at sunrise and went out to take pictures (after trying to persuade the dogs to go to the bathroom again). As the sky above began to grow lighter with the approaching dawn, I drove over to the trailhead to the spring (which is a short and easy walk along a paved trail). After a few minutes of walking, the spring came into view. 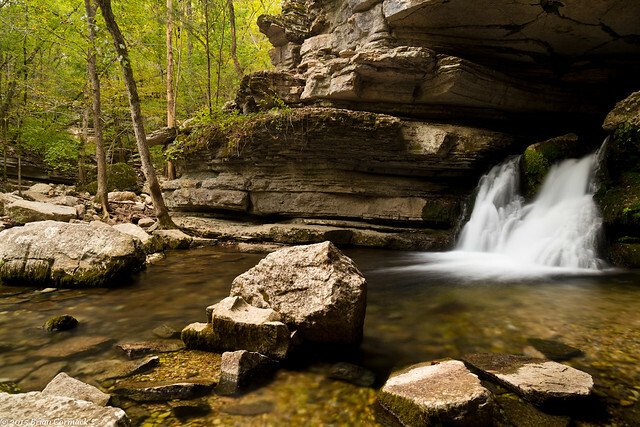 The spring here is the result of rainwater, which has slowly percolated through the ancient limestone of the Ozarks. 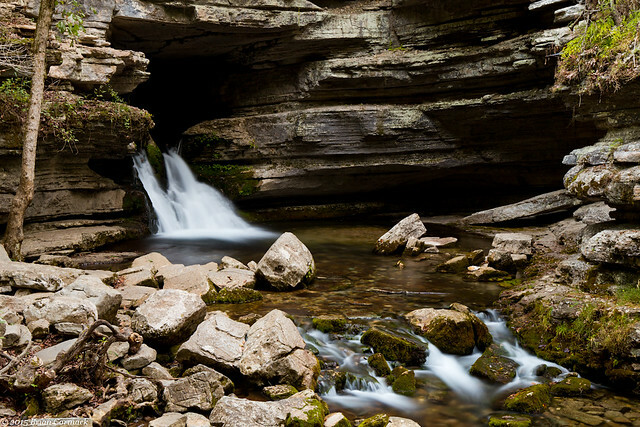 The spring has created a large cavern system that is "considered one of the most beautiful in the country" (at least according to the Forest Service, who operates Blanchard). The river that flows through Blanchard Caverns pops out at this waterfall, discharging anywhere between 1,000 to 103,000 gallons of water per minute depending on local rainfall. 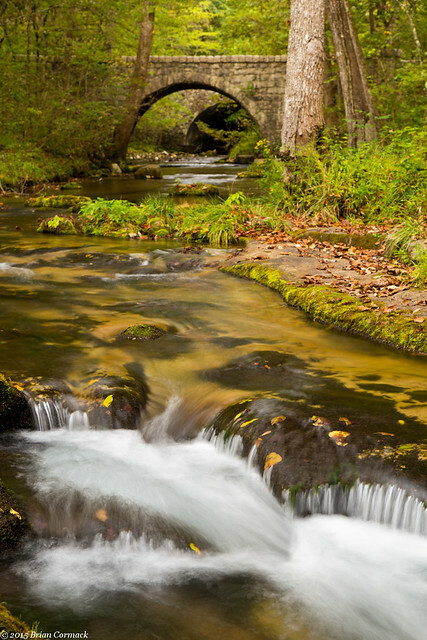 The spring water gushes out, creating this creek that rushes past moss-covered rocks. Further downstream, the spring water passes under two old stone bridges (which I assume were maybe built by the CCC? I wasn't able to find anything showing how old they were). I returned to the campsite, and soon we began to pack up the tent and load the car (much to the relief of the dogs). We took a different way home, passing by Greers Ferry Lake and Heber Springs. 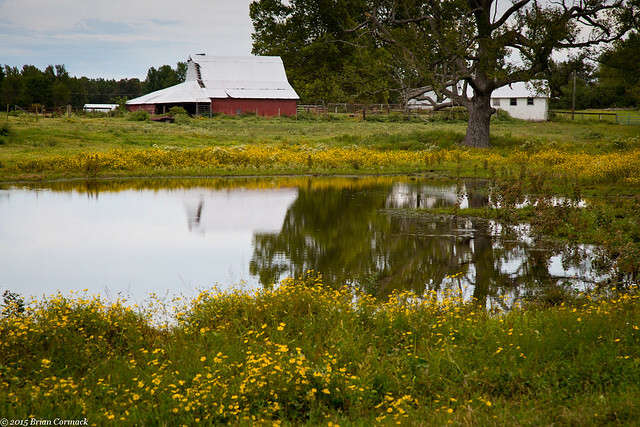 That road was less curvier, and passed by several old barns. And then we finally made it home. The dogs (who we realized were pure city dogs) were happy to return to their comfortable spots in the house. They quickly reverted back to their usual roles, guarding us from the dangers of the mailman, the occasional squirrel in the frontyard, and the terrifying small children who dastardly ride their bikes in the street. 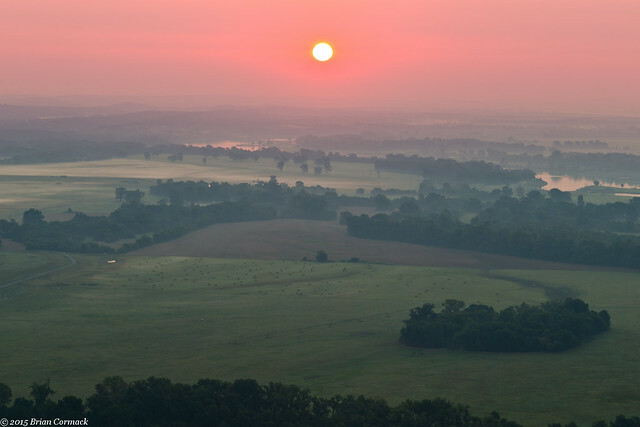 I’ve been to Petit Jean State Park many times, but have never been there to shoot sunrise from the top of the mountain (mostly because it would mean having to wake up before sunrise and driving out there). 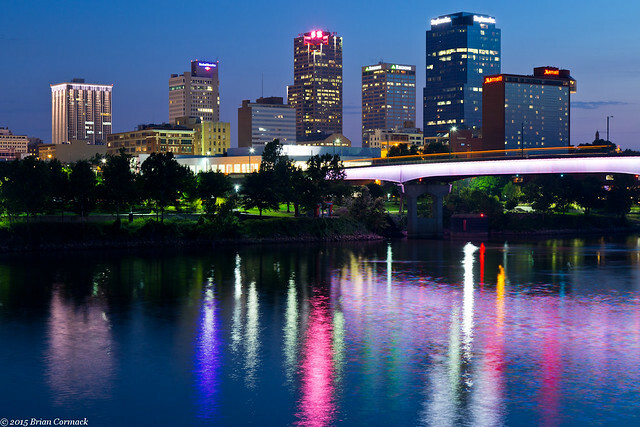 But I headed out there the other weekend with two other photographers, leaving Little Rock in the dark. 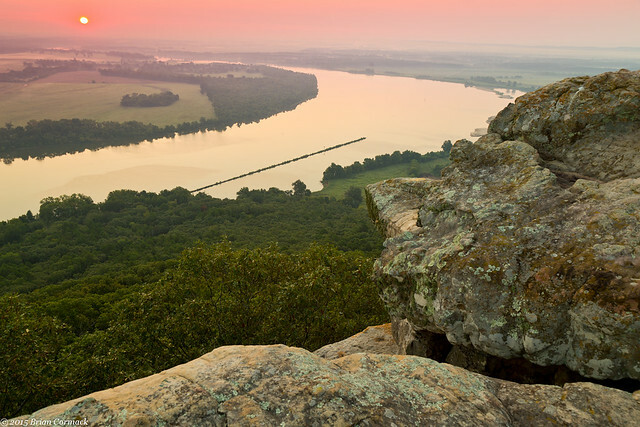 We arrived at Petit Jean before sunrise, with just a hint of pink in the sky. Eventually the sun finally appeared, rising above a curve in the Arkansas River. 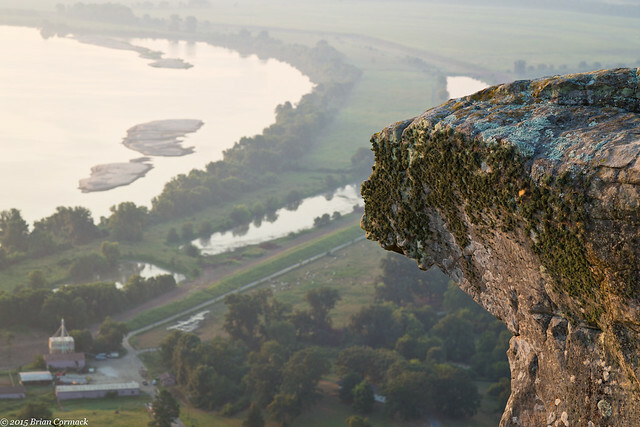 These were taken at Stout's Point, the sandstone overlook that sits high above the Arkansas River Valley (it's also the supposed location of Petit Jean's grave, according to legend). Moss and lichen colonies cling to the side of the sandstone boulders, picking out a spot with a pretty good view. We were the only ones at the overlook that morning, although we could see a few cars driving towards the mountain on the roads below. 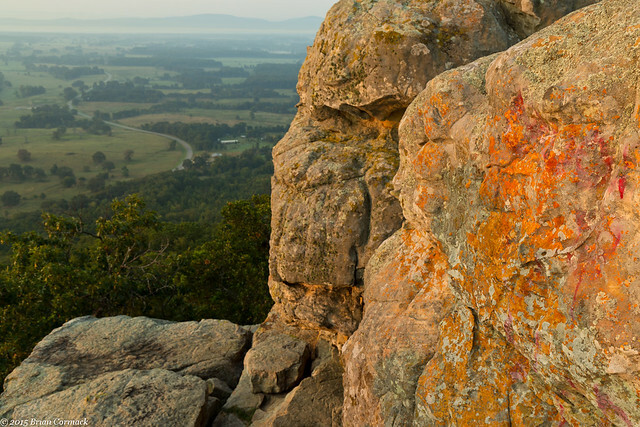 People have been visiting or living on Petit Jean Mountain for centuries, with evidence showing Native Americans living here as far back as 10,000 years ago. There was a bit of haze outside, but about what you would expect for it being the summer in Arkansas. 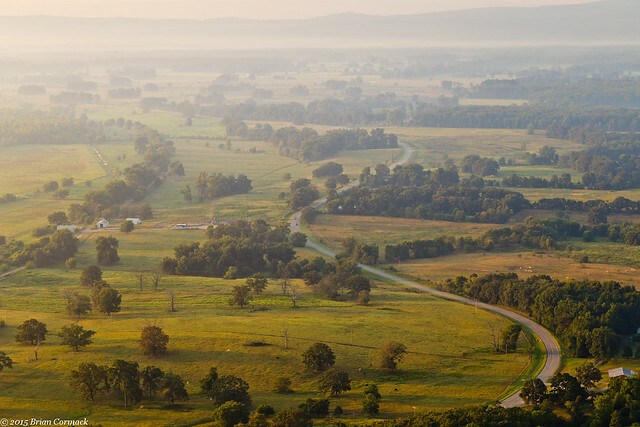 Petit Jean was even considered to be a national park, but was deemed to be too small. 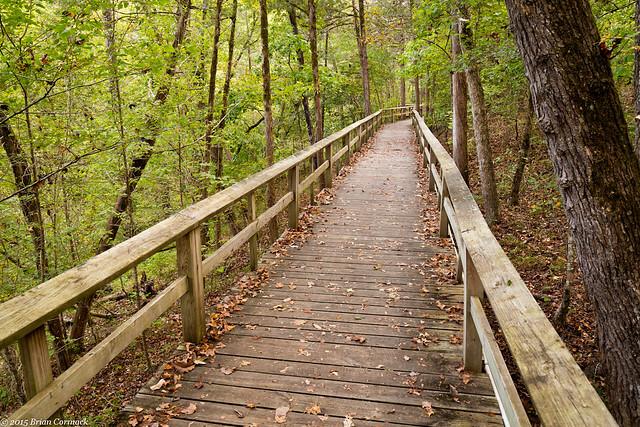 Instead it became Arkansas' first state park. Probably the most popular feature of the park is Cedar Falls, but with it being summer there wouldn't have been much of any water in it. So instead we drove over to the Rock House Cave trail. 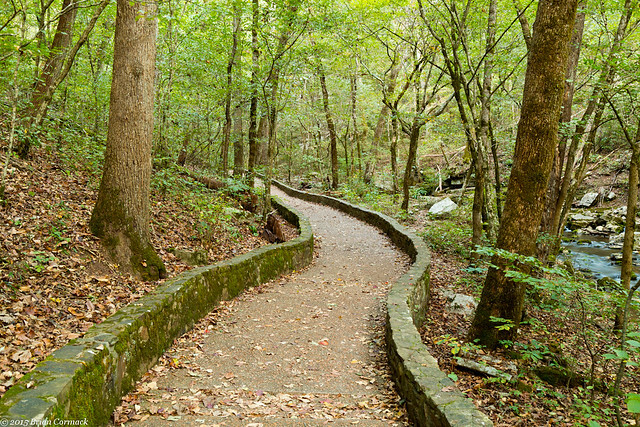 Along the way, the short trail passes by the Turtle Rocks. 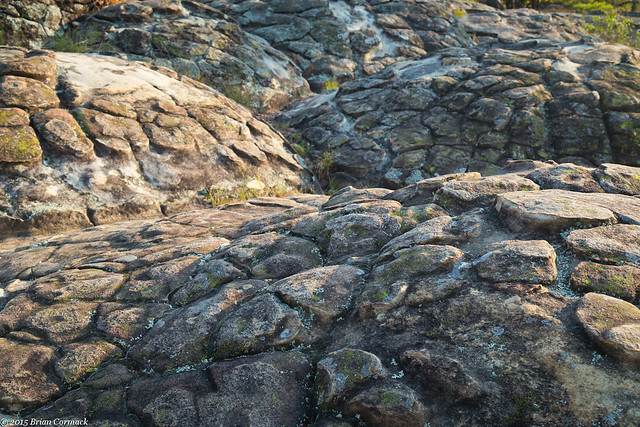 The rocks are where ground water has slowly eroded through the cracks and crevices of the sandstone, resulting in polygonal mounds that resemble turtle shells. 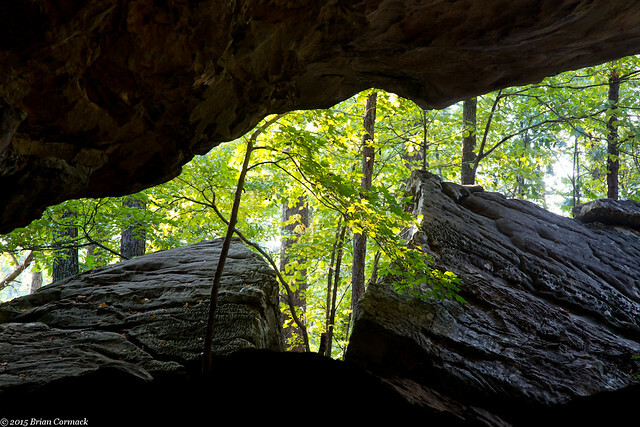 We followed the trail to Rock House Cave, which is a large sandstone shelter that extends 100 feet into the bluff. There are several examples of Native American rock art and pictographs here, some dating back at least 1,000 years. It's a great spot, easy to see why people have been living or visiting this cave for centuries. After that we headed back to the car, and started the drive back home. I was eager to take a nap in exchange for waking up before sunrise. While trying to take advantage of some nice cool summer temperatures, I headed back out to downtown Little Rock to attempt making a few more skyline pictures. I stopped at the Junction Bridge, which probably has one of the better views of the skyline and the river. Before heading back home, I made one last stop in downtown. The Pulaski County Courthouse is one of my favorite old buildings in Little Rock. 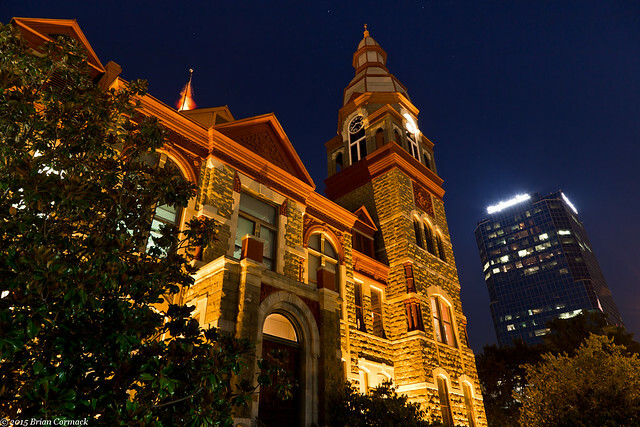 It was built in 1889, and sits near some of the city's other grand old buildings (The Old State House, Little Rock City Hall and Robinson Center Music Hall are pretty much all a block or two away from the courthouse). The Stephens Building, built in 1985, looms over the courthouse.